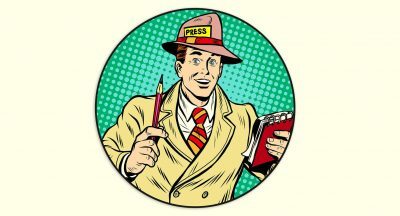 If you don’t want to wait until 2021 to get your I.D. 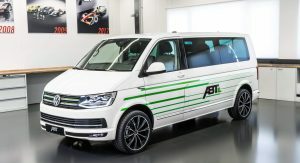 Buzz Cargo electric van from Volkswagen, the folks from ABT Sportsline might have a solution. 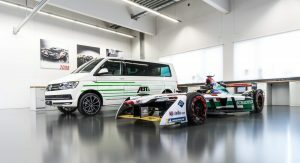 Audi’s Formula E team partner and official Volkswagen Group tuner has unveiled two interesting electric conversions at the IAA Hannover commercial vehicle show. 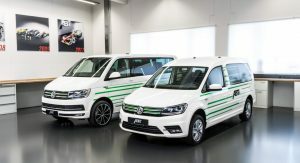 They are based on the Caddy and Transporter vans, and can be had both in cargo van or passenger configurations. 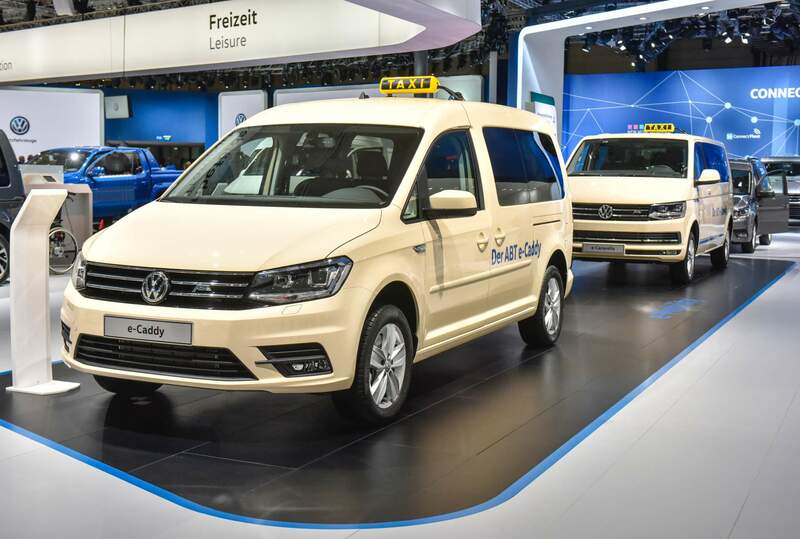 Starting off with the Caddy-based conversion, it’s called e-Caddy and it will go into production by mid-2019. 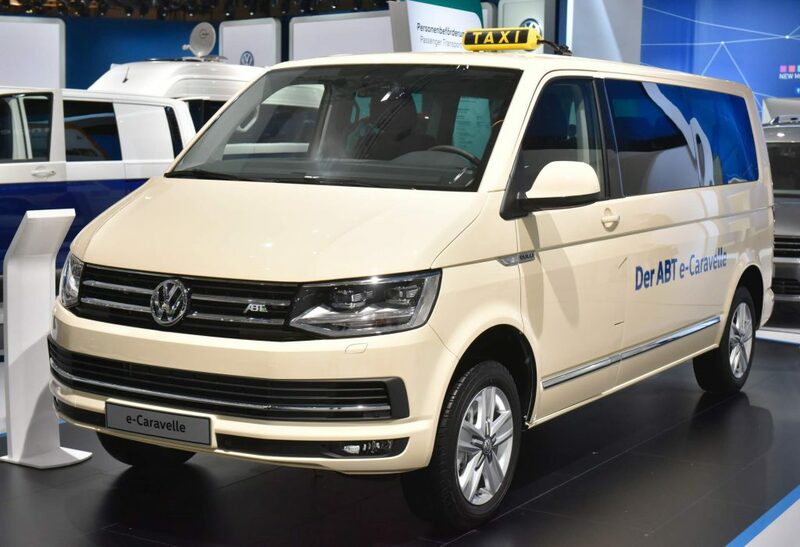 Based on the Caddy Maxi long-wheelbase model, it’s showcased in Hannover as a taxi, given its roomy cabin that can accommodate five passengers and their luggage. 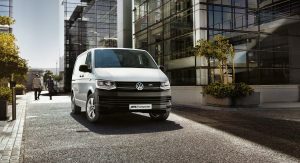 However, it can also be built as a cargo van. 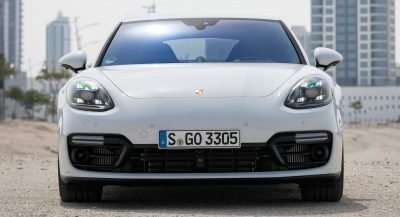 Instead of the regular model’s diesel or gasoline engines, it’s powered by an electric motor that produces 82 kW (111 PS/110 hp) and 200 Nm (147 lb-ft). 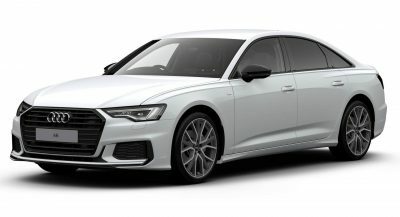 A 37.3-kWh lithium-ion battery feeds the motor and ensures a projected driving range of up to 220 km (137 miles) on a single charge (NEDC). 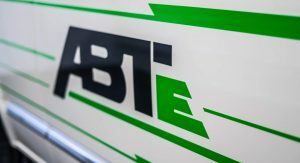 ABT says the battery can be partially replenished to 80 percent in 49 minutes using a CCS fast charger. 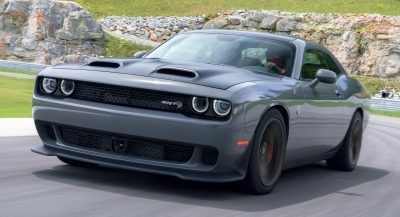 The top speed is limited at 120 km/h (75 mph). 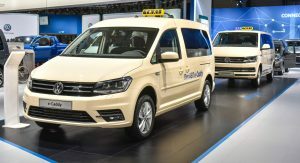 The other VW van ABT has converted into an EV is the Transporter, also showcased in Hannover as a taxi. 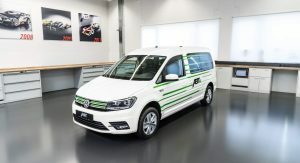 However, unlike the e-Caddy, the e-Transporter is a concept car — for now at least. 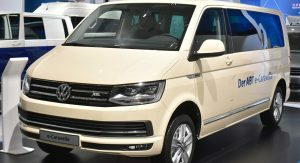 The e-Transporter is based on the long-wheelbase version of the regular model, which means it can seat nine passengers (as the e-Caravelle) or accommodate 6.7 cubic meters (236.6 cu ft) of cargo. 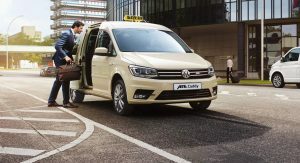 It gets the same 82-kW electric motor and two battery options: the 37.3-kWh unit from the e-Caddy or a larger 74.6-kWh pack. 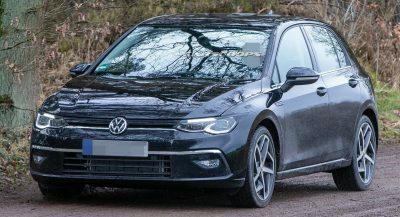 With the smaller battery, the driving range is estimated at 208 km (129 miles) while the bigger one offers a more reassuring 400 km (248 miles) of range. However, the 74.6-kWh battery takes 98 minutes to charge to 80 percent using the 40-kW CCS fast charging station. Using a 7.2 kW AC charger, the battery needs 10 hours and 20 minutes to fully replenish, as opposed to 5 hours and 10 minutes for the smaller battery. Perfect for city environments. You’re not going anywhere far in these things anyhow. 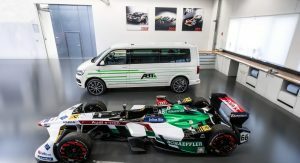 I’m pleasantly surprised by ABT, it seems really smart for them to branch into e-mobility as a VW partner. 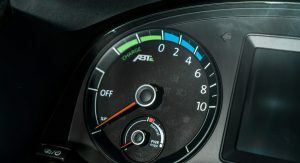 Otherwise, tuners for VAG are a dime a dozen, and the growth potential there is already limited.